Unlike many mothers, children do not usually enjoy shopping for shoes. However, children need new shoes much more frequently than the average adult. Because of their growing feet, it is important to recognize when your child’s shoes may be getting too small or worn. If your child complains about foot pain, or if you notice excessive wear on the shoe, a new pair is probably necessary. Here are some tips to keep in mind when the time for new shoes arrives. Keep in mind, many kids have what is considered ‘wide feet’ so be sure to check if a wide size is necessary. It is always better to shop in a shoe store rather than online for children’s shoes. The right measurement is critical in providing comfortable shoes for your child. Related to the above, a shoes store that specializes in kid’s shoes is always the best option when shopping. The staff will be more knowledgeable and helpful than normal shoe store employees, and you will feel confident you’ve purchased the right shoe. 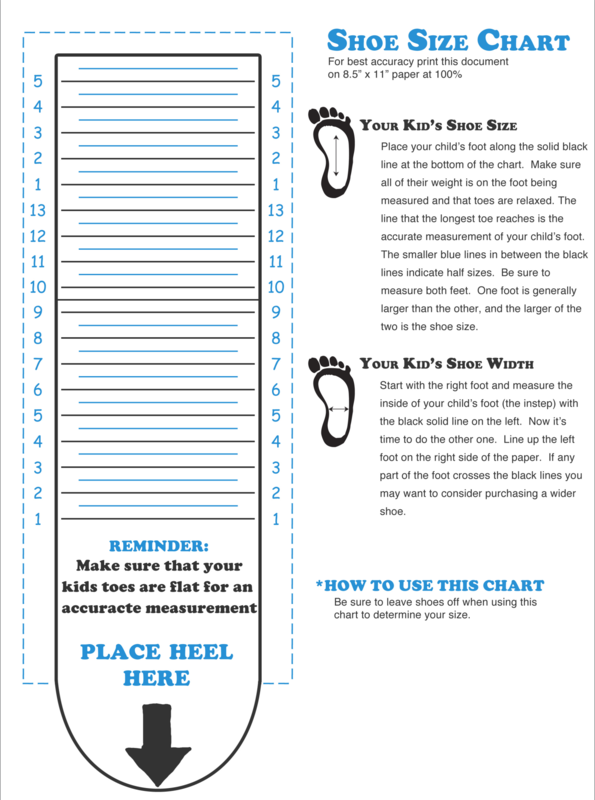 If you prefer to measure your child’s foot yourself download our Measurement Guide for detailed instructions on achieving the correct measurement.